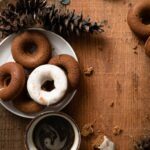 Homemade Baked Gingerbread Doughnuts with vanilla frosting. Doughnuts made with molasses, brown sugar, almond milk, and coconut oil. Preheat oven to 375 F and spray doughnut pan with non-stick cooking spray. In a medium bowl hand whisk together sifted flours, baking powder, baking soda, salt and spices. Set aside. Using a mixing bowl with hand mixer or stand mixer, combine the brown sugar, eggs, molasses, coconut oil and milk. Mix together with paddle attachment until smooth. Scrape sides and bottom of bowl to incorporate all ingredients. While continuing to mix on medium speed, slowly spoon in flour mixture. Whip until smooth batter is formed. Spoon batter into doughnut wells, filling until the better is level with the center ring. Set doughnut tray on cooling rack. Let doughnuts cool before frosting. In bowl of stand mixer, combine vanilla extract, almond milk and one cup powdered sugar. Mix on medium high until well blended. Continue to add one cup of sugar until a semi-thick frosting is formed. Transfer frosting to a shallow bowl. Gently lower top of doughnut into frosting, about halfway. Lift and rotate to coat top with frosting. Set doughnuts on serving dish. Serve with milk and coffee!